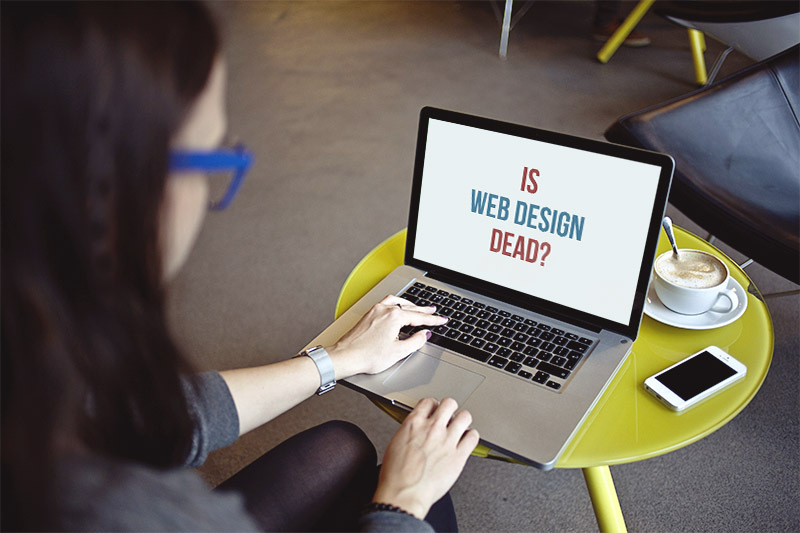 UX Magazine recently posted an article titled Why Web Design is Dead, which caused quite a bit of an uproar amongst the web designer community. The article in question is a little misleading as it thrives on a headline that boldly states web design is going the way of the dodo, but then tells the reader that UX (user experience) design is what needs more attention. It’s fine to praise UX design but there simply is no reason to throw web design under the bus in the process. Web design (UI, user interface) is one thing and UX is another. They’re separate, but equally important. Sure, using templates is most likely an affordable and easier solution to get your website up and running for the world to get a gist of what your company has to offer, but there could easily be a downfall in that. First off, tons of people have that same thought and are approaching the creation of their company website with grabbing some template on WordPress and calling it a day. You’ve quickly fallen into the boat of losing your identity and no longer being unique amongst your competitors. Besides that, your templates are coming with too many extra plugins and features, including ones you just don’t need. The problem with this is even the best companies have a hard time keeping their plugins up to date, which easily leads to sites being hacked. (This is something we can’t stress enough.) Using a template is settling for something that is close enough to what you want but doesn’t perfectly fit to your needs. Having a web designer actually do their job for you fulfills everything you need, allowing you the ability to attain exactly what you need. This maturity is good for users: they will find consistency in their daily use of the web. This point we can agree with. The consistency that web patterns have in keeping up with other web/tech innovations is enough. You can easily argue t-shirts and shoes are mature but that doesn’t mean we don’t still use them. We just choose ones that we think look great or have rad designs. Same goes for websites. It’s a designers job to make these mature web patterns look visually appealing and enticing for a company’s potential client or audience. When something can be successfully automated, it means that its practices and standards are established enough as not to need much human input. Similar to the point of templates, anything mass-produced or automated doesn’t allow yourself the chance to be unique against your company’s competitors. When it comes to business, you always want to set yourself apart from the norm. Today, this function has been completely overridden by Facebook pages. They are so efficient in making a business visible that they are rendering basic web pages useless. There is no way a Facebook page can replace a functional website. Just like any social media outlet, Facebook pages in addition to an actual website are fine. You can easily reach out and communicate with your audience, but the essence of what your company represents is easily lost. There’s no visual stimulation or uniqueness that comes in presenting yourself through your website. Also, just looking for simple information on Facebook can be a hassle in itself. How often do you visit a web site from your mobile device by directly typing the address? Only when you don’t have the app, right? Not every company fits the bill to have an app for a smartphone but that doesn’t necessarily mean that their website is obsolete on mobile web solely on that fact. I may not always directly type a web address to get to the website I’m looking for but I google a ton of things that lead me to said websites. This point is simply not strong enough to make in slow down of web design. If the site isn’t responsive, then that’s a whole new story. In the end, no matter the importance of UX design, web design is clearly not dead and there will always be a need for it. Web designers will continue to find innovative ways to make sites to do what they’re intended to do: sell a company’s services. If you’re in need of web design services, feel free to contact us today.